Abstract: Computer workers are in constant tension between meeting their deadlines and learning the tools they use to perform their jobs. Most often, the press to get work done overrides the importance of how to continually use the tool and thereby improving performance over the long run. The lack of knowledge, however, results in constant interruptions to the workflow as the engineer tries to “bend” the tool to meet their tasks. This paper presents a method to convert these workflow interruptions into targeted opportunities for training that can be leveraged through the use of an inline trainer. An inline trainer is a tool that works in parallel with the main application to promote continuous learning through the introduction of small amounts of information that over time lead to a richer understanding of an application. Data is presented demonstrating that when provided with an inline trainer, users will leverage the tool to improve their daily work, making more productive use of already occurring interruptions. Abstract: A positive peer learning collaboration is one where each participant engages with their partner’s point of view. The negotiations that result from such engagements are the key to a productive collaborative learning experience. This paper presents a framework for in-class programming exercises done by dyads of students whose activity was mediated by an online learning platform. To maximize the amount of positive collaboration that occurs, it is crucial to consider the design of the interaction. The overall structure of the interaction for the platform described in this paper follows the think-pair-share (TPS) paradigm. The focus of the design is on the pair stage, which is where the heart of the collaboration lies. A model is developed of the progress of interaction during this stage, which is used to explain the data collected from a study of dyads of students engaged in problem-solving activities for short periods of time. A microgenetic analysis shows that students actively engage in collaboration through considering, comparing, and negotiating alternate viewpoints for a given. Abstract: This paper presents a case study of students in a blended class doing their homework online in small team-based collaborations. The distributed nature of their collaboration makes the collaboration more piecemeal and abstract, but nonetheless, small teams of students are able to coordinate their work and jointly problem solve, periodically and regularly aligning their views, coordinating their efforts, and sharing their understanding and work. During the semester, the students do four homework assignments, alternately working on two different kinds of different time and place platforms. A venue is a virtual approximate of the copresence that exists for collaborators in real space. The focus of this paper is on the emergence of different types of venues and the role venue plays in conditioning collaborative problem solving within a joint problem space. Abstract: It is well understood that engagement is an important condition of learning: when engaged, a student learns more. This paper presents a study of engagement in a collaboration on a learning platform where the students work DTDP. The data presented centers on the relationship between changes in engagement and changes in performance, particularly across assignments. The analysis is framed in terms of an adaptation of the four facets of engagement as developed by Suparna et. al. The reworking of the facets is necessary because of the distributed nature of the collaboration in a virtual environment. Analysis of the data shows a significant set of relationships between reading the posts of other students, conceptual-to-consequential engagement, and improvement in performance. Abstract: The Apprenticeship Project is an original approach to linking two very hard problems – dissemination of technology-mediated learning methods and improvements to the preparation of undergraduates for a STEM workforce. A standard computer science curriculum based on knowledge and skill acquisition augmented with a project-based student community of design/builders is a significant addition to current methods for educating students and preparing them for a STEM-based workforce. An ecosystem can be developed that leverages the work of undergraduates as a mechanism to face-lift the technology-base of the classroom. Custom-building education platforms is a necessary and significant complementary approach to generic platforms as a method for propagating technology-mediated pedagogy. This project creates a how-to model for converting institutional need into opportunity for a community of learners. Professor Tim Hickey working with a colleague, Professor Rebecca Torry in Mathematics and two of his graduate students have been exploring new ways to visualize the problem solving strategy of students in college level Science classes. The graph here shows the strategies of novice student trying to write a program to convert dates from U.S. format to European format. This approach provides a method for visualizing all of the problem solving strategies of an entire class on a particular problem. It allows one to easily identify the common mistakes as well as to identify students who apply novel problem solving strategies. Abu Deeb, F., Kime, K., Torrey, R., & Hickey, T. J. (n.d.). Measuring and visualizing learning with markov models. In 2016 IEEE frontiers in education conference, FIE 2016, erie, PA, USA, October 12-15, 2016 (pp. 1– 8). IEEE Computer Society. Professor Harry Mairson, whose research previously focused on logic and programming languages, has started a new project on software for classical string instrument design. He has implemented seventeenth-century formulas for violin and cello design in software, and has prototyped its use in design, manufacture, teaching, and historical investigation of the evolution of instrument forms. He has presented this research to the National Endowment for the Humanities, the Oberlin Violinmaking Workshop, and the Violin Society of America. 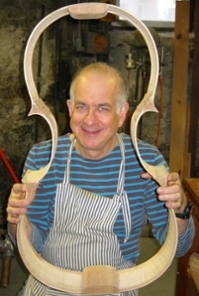 This fall, he expects to bring his work to schools of lutherie in Cremona, Milan, and Venice. A serious amateur luthier, he is currently building an instrument based on the Stradivari ‘Cristiani’ violoncello, using software. After running a workshop for a group of professional violin makers at Brandeis, Dr. Mairson wrote, ‘It was tremendously exciting to see a bunch of violin makers-whose expertise is woodworking-writing code instead.” Harry’s research on this subject is supported by grants from the Office of Digital Humanities at the National Endowment for the Humanities, and from the National Science Foundation. Russian requests, Mandarin particle, English tags as windows into the interaction of grammar and context. Sophia Malamud directs the Meaning In Language (MILa) research group within the Brandeis Laboratory for Linguistics and Computation, which investigates the contributions of linguistic structure, cultural convention, and inference to the ultimate use of utterances. Dubinina, Irina Y. & Sophia A. Malamud (forthcoming in 2017) Emergent communicative norm in a contact language: indirect requests in Heritage Russian. Linguistics - an Interdisciplinary Journal of the Language Sciences. 55(1). Abstract: The present paper contributes to the study of speech act pragmatics, language contact, bilingualism, and heritage languages by bringing attention to the pragmatics of a contact language, heritage Russian (HR). The main goal of the current study is to create a baseline for the pragmatic competence of speakers with incomplete acquisition of L1, which characterizes language contact in immigrant populations. We focus on communicative strategies and the choice of linguistic forms in requests made by heritage speakers of Russian, native speakers of full Russian, and native speakers of American English. The specific research questions explored in this study are: Is the linguistic variable – the form of polite requests – correlated with the population (speakers of HR vs. speakers of full Russian)? How do the differences play out? Do HR speakers have their own communicative norms? If yes, did these new norms develop under the influence of English or as a result of language-internal restructuring? We report that HR exhibits evidence of developing its own conventions for expressing polite requests which differ from the corresponding conventions in full Russian. These emergent communicative norms in HR seem to be partially influenced by English, but may also involve language-internal change. Sophia A. Malamud & Allyson Ettinger (2016) Utterance modifiers “ba” and reverse-polarity tags in the conversational scoreboard. Workshop on Formal, Probabilistic and Typological Approaches to Discourse Particles and Modal Adverbs. 28th European Summer School on Logic, Language, and Information, Bolzano, Italy. We compare Mandarin utterance-final particle ba (吧) (1) and English reverse-polarity tags (2) as a window into the model of conversation. We propose a model in which conversational moves are proposals to collaboratively update the common ground between the speaker and hearer. The model includes a scale based on the level of responsibility the speaker takes for the proposed update(s). We propose that both the Mandarin ba (吧) and the English reverse-polarity tags convey that the speaker takes less than full responsibility for the utterance to which these modifiers attach. The effects of softening or soliciting confirmation follow from this delegation of authority; the effects of speaker uncertainty, reluctance, delay, and politeness are derived as indirect inferences based on the context of utterance. The English tags mark the associated utterance as destined for the fairly-high-responsibility portion of the scale, while the moves marked with ba may have a broader range of speaker responsibility, from fairly high to medium. Our model allows a handle on a variety of utterance modifiers and a unified treatment of various speech acts, with consequences for the treatment of indirectness, performatives, and proffered content. At the end of each medium to large student project, we often ask a student or team of students to register their project for our showcase. Some of these were part of regular courses, others were independent studies and others were part of industry partnerships. Visit the Student Software Project Showcase to see the code, the presentations and the project summary pages for some of our recent projects.